A group of workers at Whole Foods Market is leading an effort to establish a union for the Amazon-owned company’s 85,000+ workforce. 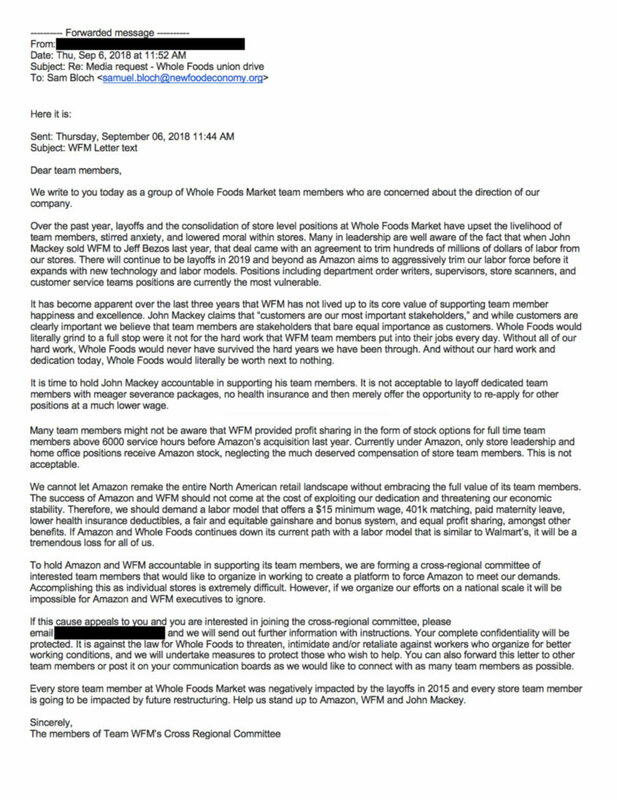 In a letter addressed to Whole Foods employees, the group — members of Whole Foods’ cross-regional committee — wrote that they are “concerned about the direction” of Whole Foods in an Amazon era. The letter outlines several demands, including a $15 minimum wage for all employees, 401k matching, paid maternity leave, lower health insurance deductibles and more. “We cannot let Amazon remake the entire North American retail landscape without embracing the full value of its team members. The success of Amazon and [Whole Foods] should not come at the cost of exploiting our dedication and threatening our economic stability,” they wrote. The grocery store chain was acquired by Amazon one year ago in a $13.7 billion deal that sent shock waves through the e-commerce and brick-and-mortar retail industries. In that 12-month period, the e-commerce giant has implemented changes to the grocery chain’s nearly 500 stores. Amazon Echos have become part of the inventory in some locations and Amazon lockers have shown up to facilitate Amazon.com pick-ups and returns, for example. Since the Amazon acquisition, several hundred Whole Foods workers have been laid-off as Amazon infuses “Whole Foods with its efficient, data-driven ethos,” per The Wall Street Journal. Shoppers, however, have saved millions as a result of the shake-up. Amazon provided a virtually identical statement, adding that they encourage anyone concerned about employee treatment to take a tour of one of their fulfillment centers. Here’s the full letter, obtained by New Food Economy.